This homemade chicken soup for cold and flu season will get you feeling better in no time. If you’re wondering how to make chicken soup, you’ll find that it is much easier than you think. Prep a batch now and stash it in your freezer so you don’t have to cook when you are under the weather. When I went hunting for a real deal homemade chicken soup for the flu, I only found recipe after recipe that called for adding pre-cooked chicken meat to boxed prepared chicken stock. 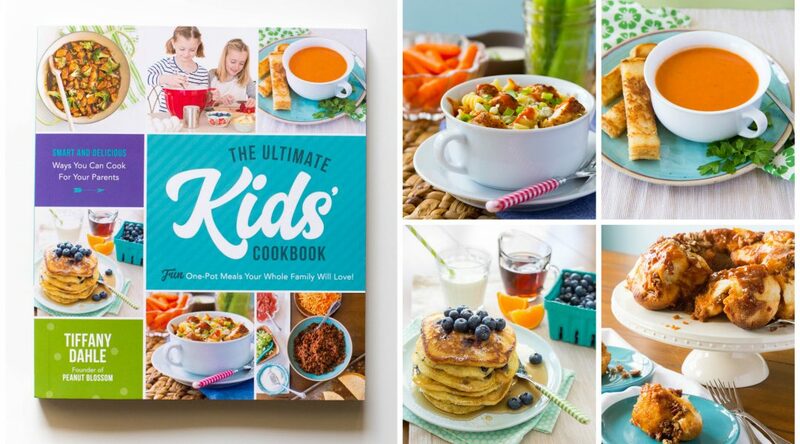 Those recipes are easy and better than canned soup because they involve fresh vegetables but they don’t have the same benefits as chicken soup from scratch offers. This recipe is the best home remedy for cold and flu because it also adds fresh roasted garlic and lemon juice and spicy cayenne pepper to the broth. Garlic, lemon, and spicy seasonings are each known home remedies for cold and flu. Add everything to the same pot and let it simmer for 2.5 hours. 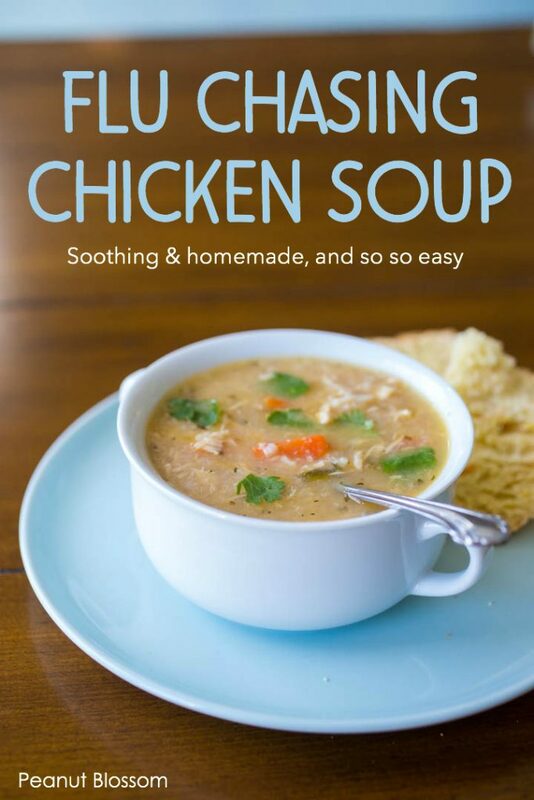 Is homemade chicken soup easy to make? I experimented with a couple of different soup recipes in my crock pot and my InstantPot, but felt frustrated that the process for making homemade chicken soup wasn’t more simple. Over our winter break, we were all craving some homemade soups to beat back the cold weather. I stumbled across a new recipe for homemade chicken soup that is just right for chasing the flu away. It checked off all the boxes I needed: a real whole chicken, oodles of roasted garlic, fresh squeezed lemon juice, and spicy cayenne powder. It’s like all the major home remedies for colds and flu rolled into one totally delicious AND EASY homemade chicken soup. The recipe uses just one big pot and only requires about 2.5 hours to make on your stove top. The roasted garlic takes a little extra time but it sooooo worth it. In a pinch, you could just saute some minced garlic in a little olive oil until just barely toasted and add that to the soup instead. But, roasted garlic has a sweeter, milder flavor and is perfect for picky kids. Handyman Tim took one bite and declared this chicken soup: “Epic! This would be perfect soup when sick!” For a guy that is fairly stingy with his praises, this was a jaw-dropping comment. With flu season at it’s feverish peak right now, I wanted to share this with you. The chicken soup recipe makes a nice big batch so you’ll have plenty to stock your freezer with single-serving containers for emergencies. Cook up a batch now because it is one of the best things to eat when you have the flu. 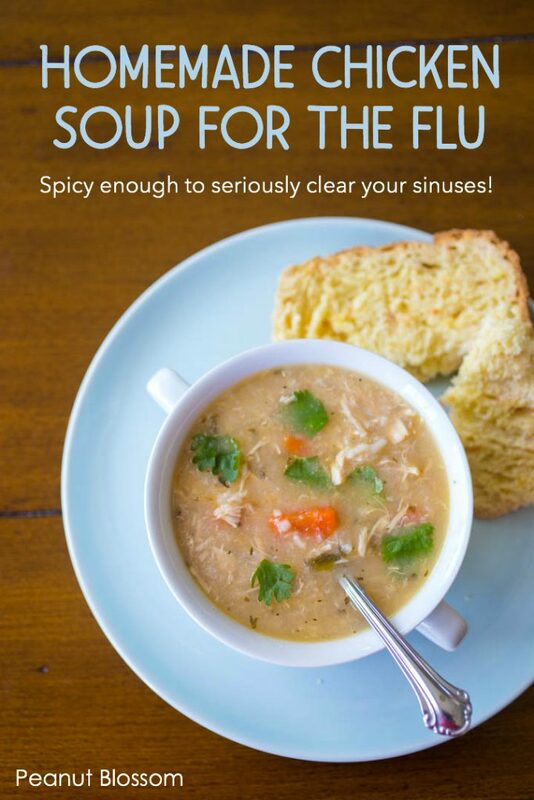 Our chicken soup is a lot spicier than regular soup and it does a phenomenal job of clearing your sinuses. That is Tim’s very favorite part. When I made it a second time, the spices seemed not as strong despite using the same quantities. So, be sure to taste test it before serving and adjust as needed. You want the cayenne and cinnamon to really show through so don’t be shy about adding a little more if it needs it. Your stuffed up sinuses need to feel the punch and your sore throat will love the lemon. 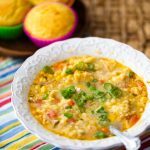 If you think your kids would shy away from the lemon and spices, you might prefer this crockpot chicken soup. It is also made from a real raw chicken breast, but is a little bit easier for you to make with less hands-on time. P.S. If you liked this healthy recipe, you’ll love the updates I send to the subscribers of my email newsletter. You can sign up for your very own copy right here. 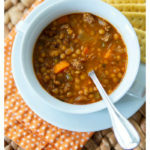 Adapted from The New England Soup Factory Cookbook which is available for only $5 on Kindle right now! Preheat the oven to 375 degrees. Line a small baking dish with a square of tin foil. Place the peeled garlic cloves and the olive oil into the dish and loosely wrap and cover it with the foil. Cover the baking dish and bake for 35 – 40 minutes until the garlic is softened and caramelized. Remove the garlic from the oil and mash it in a small dish with a fork. Set aside. Rinse the chicken in cold water and place it in a large stockpot. Peel the onion and cut it into quarters, add it to the pot. Peel the carrots and dice them into bite-sized pieces, add them to the pot. Rinse the celery and chop it into small chunks, add it to the pot. Pour the chicken stock over the veggies and chicken and bring to a gentle boil over medium-high heat. Stir in the reserved garlic, lemon juice, lemon zest, mint, cinnamon, cayenne pepper, and bay leaves. Reduce the heat to medium-low and simmer for 2 1/2 hours. Use a pair of large slotted spoons or spatulas to carefully remove the chicken and place it on a plate. The chicken will be so tender, it’s wise to use your slotted spoon to check the pot for any remaining small bones that might have broken away. Remove the bay leaves when you find them. Remove the chicken skin, shred the chicken meat, and return the chicken meat to the soup pot. Stir in the cooked rice. If the soup seems too thick, you can add a cup or two of chicken stock or water to help thin it back out. Test the seasonings and adjust. The soup should be bright and lemony with a spicy kick from the mint and cayenne.